It is approaching the unbearably hot and humid temperatures that we all have a love hate relationship with here in Florida. Fair Disclaimer- I will be wearing less and less clothing in my fashion posts! On this day it was a particularly sticky one and I needed to be comfortable to walk around outdoors and explore. I found these awesome American Apparel high waist shorts with floral detailing at a local thrift shop. They are old season but I found some links below of the exact identical item if you are looking for a similar outfit. 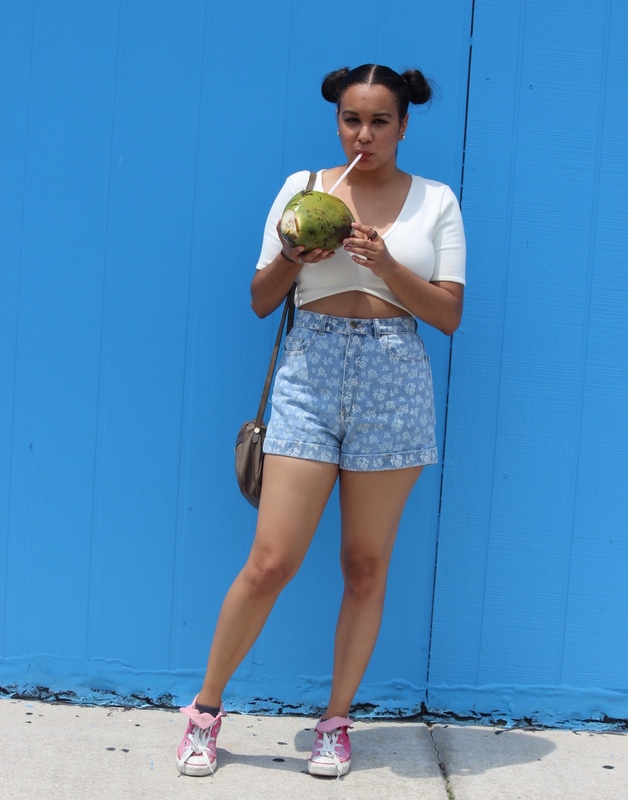 You can’t go wrong with denim shorts, a crop top (featured here before from Nasty Gal), any neutral cross-body like my favorite vintage Salvatore Ferragamo one and my pink Converse chuck’s that I’ve had since the 9th grade. Easy no brainer outfit perfect for what is sure to be a scorching summer. P.S this coconut was the best thing ever!! Links to items down below.